The Philippines, being a tropical country, is blessed by abundant rainfall the whole year round that if properly managed, even with natural anomalies like El Niño phenomenon should hardly make a dent in the water resources. But that isn't the case here as always. There's the ever present mismanagement as well as simple incompetence by people whose tasks are to look over this precious but often taken for granted resource. 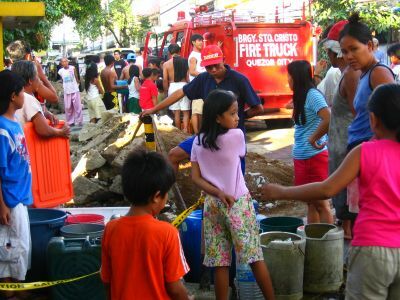 Yesterday morning people in a large part of Quezon City woke up without water from their faucet. It was worse in Veterans Village where they celebrate their fiesta the following day. 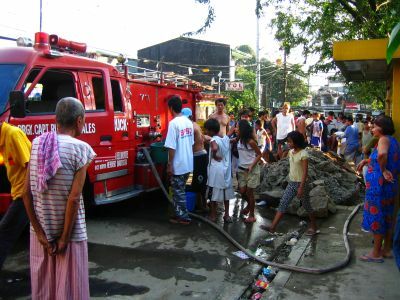 In barangay Katipunan, people eagerly await rations from volunteer firemen, including the Chinese fire brigade, more dependable than those officially tasked with the job. 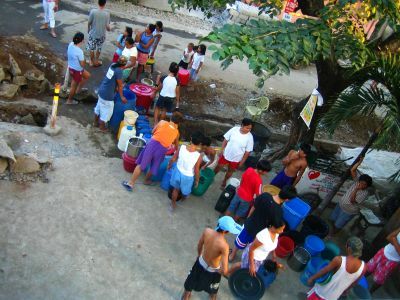 Since the barangay doesn't have enough money in its coffers to pay for such expense and that funds can never be dispensed at that instant, they required people to pay measly amount of P1 per bucket with large containers to cost more but some people didn't want to pay, got irritated and started harrassing the drivers, volunteers that they are. What a vulgar display of ingratitude and arrogance! the firetruck's pump conked out after delivering a few buckets and so had to be repaired, but never came back probably turned off by the arrogance of the people who should've been grateful of the help they got-- gratis that is! Good thing water service was restored around 7pm to the cheers of the people! Even if I don't live there, I know how hard life is without water but since i'm an "anak ng pasig," I only smiled to myself knowing I'm ahead of them "ng isang paligo."